Do you know what I love most about my local vintage shop BlackBird Attic? They always seem to have exactly what I am looking for. 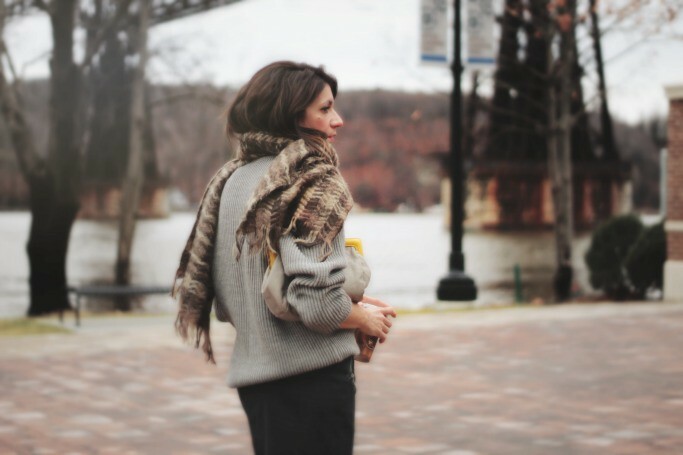 I've been searching for a slouchy grey sweater all season, and voila, she has one. Big oversized scarf? yup, got that too. I always tell the owner, who is also a friend, that it just amazes me how she she gets such on-trend vintage pieces. It's not necessarily about what you pair a vintage item with that will make it modern. You can actually find modern, vintage pieces. My number one rule of thumb..know what you are looking for and you will most likely find it. Vintage doesn't have to "look" vintage, it just makes it that much cooler that it is! This entry was posted on Monday, December 9, 2013 and is filed under blue,grey. You can follow any responses to this entry through the RSS 2.0. You can leave a response. Once again...an amazing look!! I wish I had a vintage store in my neighbourhood, too; you can bet I'd be in there almost daily, looking for treasures like what you've found here!! And by the way...L.O.V.E. those boots!! That sweater is perfect! Perfect shade of grey and I love how cozy it looks. holy guacamole this is perfection…so jealous of that little vintage shop…..ours are nowhere near this caliber. this whole look is just perfection!! you enjoy those yoga pants today!!! I love the gray and black. Those boots are pretty fabulous on you. So chic! Sheree I love your scarf, I love your sweater, I love your boots... Yes you guessed it: I LOVE your outfit, you gorgeous gal, you!! Scarf is awesome, great photos! I love your mix of different textures! "Vintage doesn't have to 'look' vintage". So true!